The Village at Old Mill is an active, yet tranquil 55+ community in Westminster, Massachusetts. Sitting on a picturesque New England hillside, the Village at Old Mill features exceptional views of Wachusett Mountain. Residents enjoy private living in distinctive single-family homes. The Village at Old Mill’s convenient location provides easy access to many cultural and recreational activities in the area while also offering 70+ acres of protected open space. Learn more about the Village at Old Mill below. If you have any questions, or if you would like to see a property in person, please contact us! 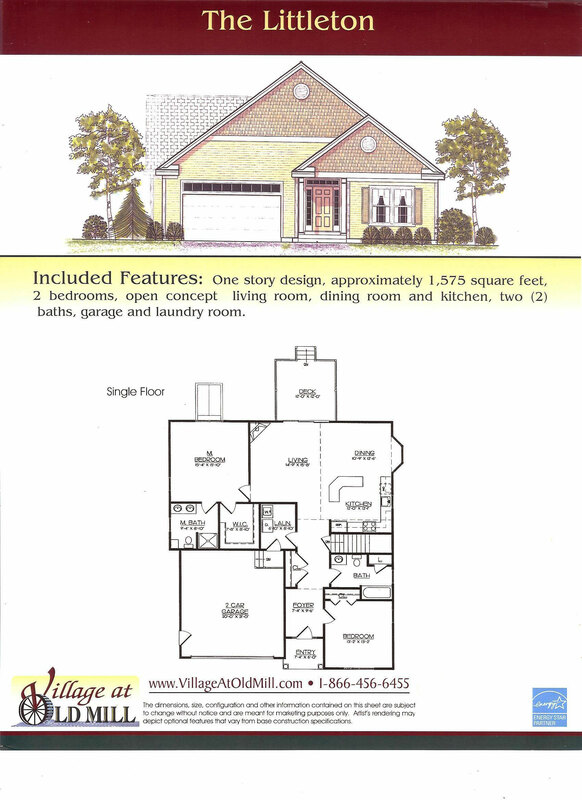 Search currently available homes for sale at the Village at Old Mill by selecting either Single Story or Two Story. The Village at Old Mill is located in beautiful Westminster, Massachusetts. Westminster is an active suburban community of about 7,000 residents at the base of Wachusett Mountain in North Central Massachusetts. Town of Westminster Community Information page has a variety of community groups, events, and information. The Village at Old Mill is a warm, welcoming and supportive Adult Community that fosters a friendly, positive, and safe neighborhood community in which residents are able to enjoy happy, healthy, peaceful, and fulfilling lives and retirements. At least one member of the household must be 55+ years of age in order to move in. Each home is on a deeded lot. At the Village at Old Mill residents enjoy a maintenance-free lifestyle. Lawn care and snow removal are taken care of by professionals and all homes feature vinyl siding, vinyl windows and composite decking materials. The development has a Homeowners’ Association. Moderate restrictions and protective covenants are in place to maintain the appeal, integrity, and enjoyment of everyone at Village at Old Mill. The properties at Village at Old Mill come in six home styles: The Littleton, The Lancaster, The Harvard, The Ashby, The Princeton, and The Sterling – 3 single story floor plans and 3 two-story floor plans. Each home is individually designed for you and is constructed of the highest quality. These homes are energy efficient and offer a myriad of standard amenities. As the buyer, you choose the materials, cabinet colors, the particular piece of granite for your counters, lighting fixtures, and more! 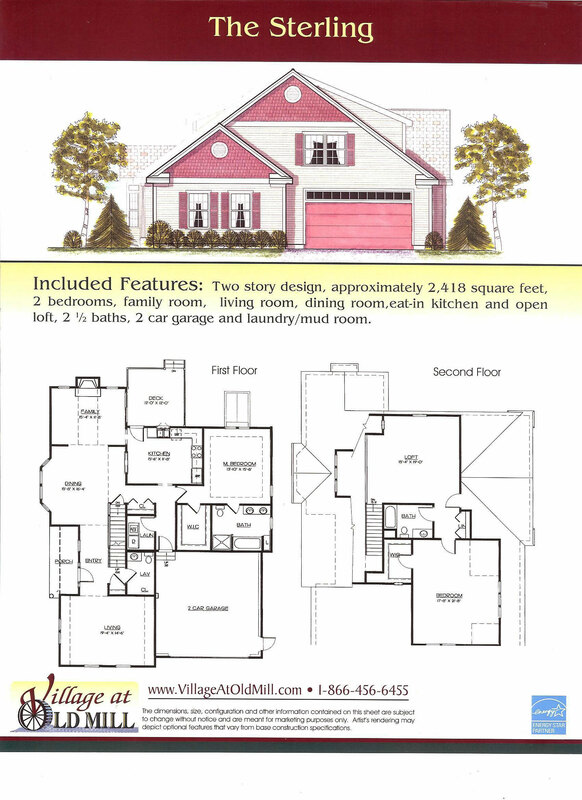 To view floor plans of each home, select a link below. The Littleton is a single floor, 2 bedrooms 2 baths, open concept home, with approximately 1,575 square feet of living space. 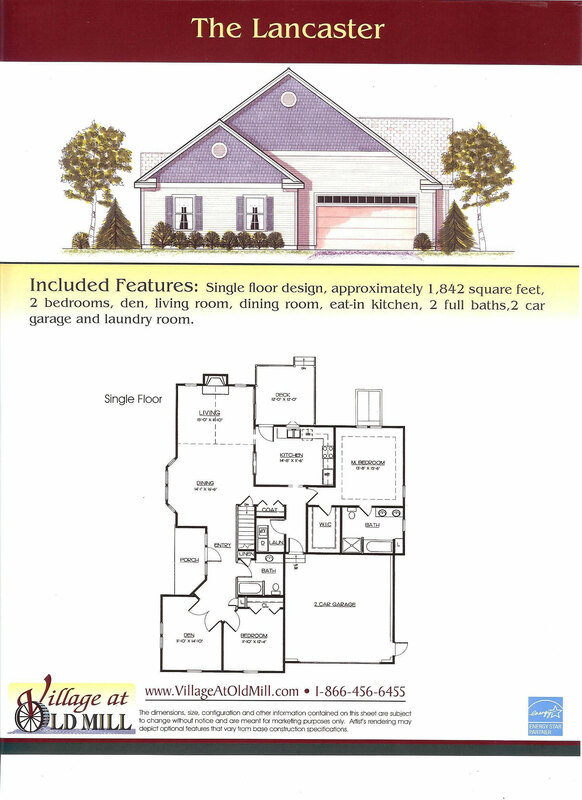 The Lancaster is a 2 bedroom 2 bath, single floor home featuring 1,842 square feet of living space. 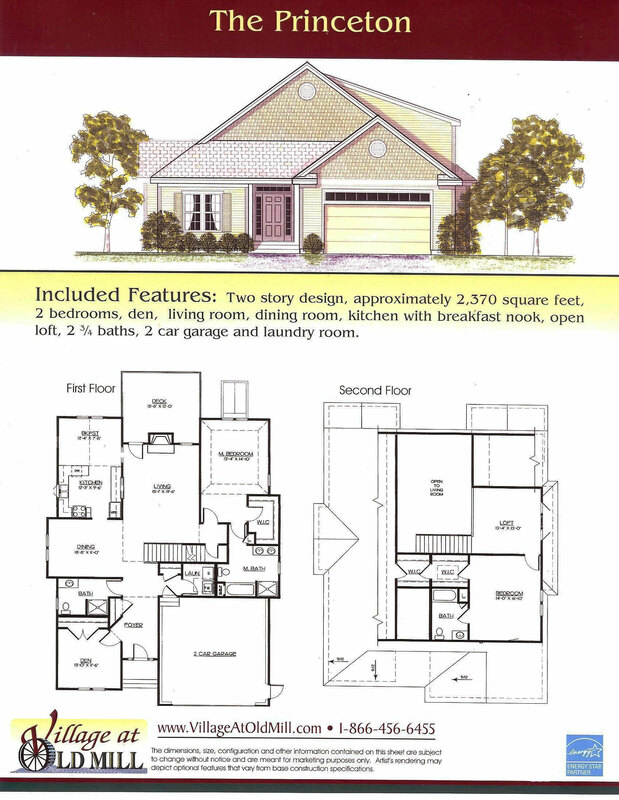 The Harvard features 1,815 square feet of living space on a single story with 2 bedrooms and 1 ¾ baths. The Harvard layout also features a breakfast nook in the kitchen. 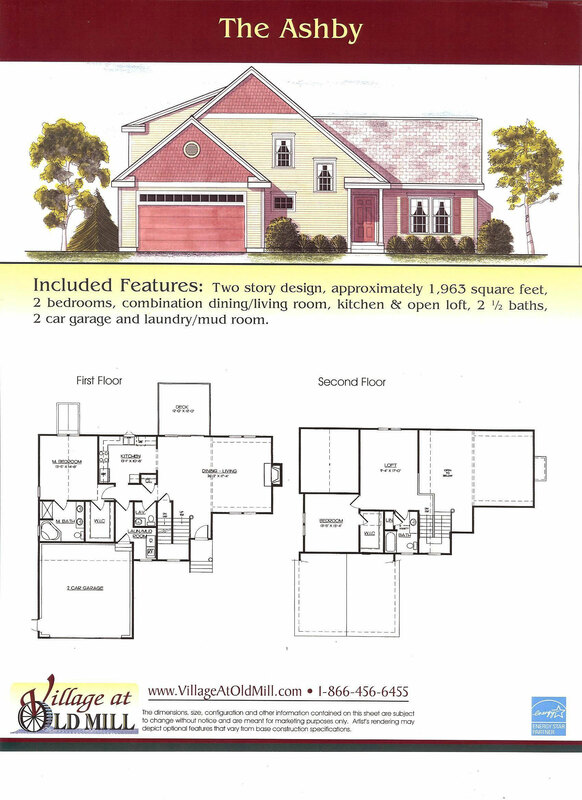 The Ashby is a two story, two bedrooms 2 ½ bath homes with 1,963 square feet of living space. The Ashby also includes an open loft space. The Princeton offers 2,370 square feet of living space on two stories with 2 bedrooms and 2 ¾ baths. The Princeton features both a breakfast nook and an open loft space. 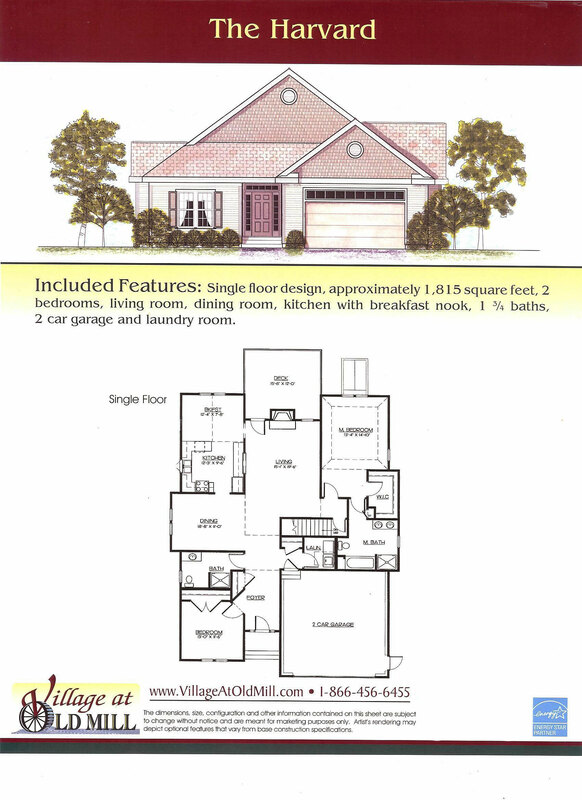 The Sterling is a 2,413 square foot home with two bedrooms and 2 ½ baths. The Sterling also features a laundry/mud room. All homes in the Village at Old Mill have a variety of standard features. Model homes are built with standard features, and just a few upgrades to show you some of the most commonly added options. Some of our standard features include first floor master suites, gas fireplaces with glass enclosed direct vents, natural gas heating and central air conditioning, energy star rated appliances, two car garages with electric door opener, open sun deck, maple kitchen cabinets with granite countertops, underground utilities, lawn irrigation, and so much more! In addition to the standard features available for every home, we also offer additional upgrades which include a sunroom, screen porch, security alarm system, and more. For a full list of all the features available, please contact us! The Village at Old Mill is being developed by Tom Murray and Gary Litchfield of Westminster Properties, LLC. Tom Murray has over 45 years in land development, road building, and site preparation. He is a successful, highly regarded builder. Gary Litchfield has over 40 years in the real estate industry including land development, marketing and construction of single family and multi-family residences. He is a past Director of the Builders Association of Greater Boston. Having been in business together since 1997, and working with an impressive management staff, they have produced inviting communities offering quality and value throughout Massachusetts and southern New Hampshire. Their philosophy of teamwork, coupled with keen attention to detail and outstanding customer service contributes to the design of well- constructed and energy efficient homes.